You Need Equipment Right Now, We Can Help With The Financing. 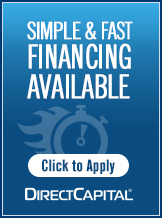 Chicago Industrial has partnered with Direct Capital to provide our customers with competitive, user friendly financing. Instant financing up to $100,000 with no financials required. 24-hour turnaround on your application. Deferred and seasonal payments to match your cash flow cycle. Financing terms from 12 – 60 months. Add or upgrade equipment over time with simple one page document. Flexibility in building a program that meets your specific needs. If you choose to do so, a representative from Direct Capital will contact you directly.